This booklet collects two fascinating papers on ancient weapons and armour. "Ancient Armour" was a serial article on ancient armour and weaponry published in The Family Magazine for 1839, edited by Eli Taylor. It covers helmets, body armour, shields, spears, swords, other "engines of war," and standards used by Egyptians, Romans, Greeks, Israelites, and other ancient cultures. Numerous engravings accompany this popularly-written article. "Observations on the Use of the Sling . 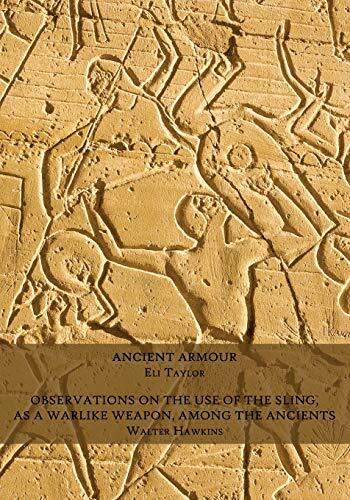 . ." by Walter Hawkins gives a detailed look at the ancient use of slings in warfare. This article was published in Archaeologia in 1847.